Guest post by Jessica DeMilt of Pennington Creative. Did you know that approximately 78% of people living in the United States use at least one social media platform? From Facebook to Twitter to whatever cool new platform the kids are using these days (Snapchat? Musical.ly? I don’t know, I’m not young), social media is where the people are—so it’s also where your business should be! These platforms make it easy for companies to connect with consumers to build bigger followings, spread the word about new products and services, and share valuable information. With so many social media platforms available, it can be difficult to know which ones to use. You want to make sure you’re reaching the right people but you don’t want to spread yourself too thin by trying to keep up with too many different profiles. Part of creating a successful social media marketing strategy is knowing which platforms to use and which ones to avoid. You don’t want to be wasting your time on Pinterest when most of your potential customers are on Twitter, right? Do some research to figure out what social media platforms are most popular among the people you want to reach. Focus on creating profiles and posting regularly on a few platforms that your customers are definitely on instead of trying to post on every platform and reaching people who might not even be interested. As mentioned above, maintaining an active social media presence is essential if you want to use these platforms to build brand awareness and reach new potential customers. It’s important for businesses to have an online presence because customers look online for pretty much any product or service they need. It’s not enough to just have a great website (although you definitely need a great one! ), customers also want to be able to find you on social media. These platforms make it easy for customers to find reviews, ask questions, and even learn about a company’s personality, so you’ll want to post regularly on any platform you use. Planning posts in advance is the best way to stay on track, and tools like Sprout Social and Buffer can help. These websites let you schedule posts in advance, and they publish them at a pre-determined time and date. You can create social media posts for the entire week or month and then let the app do all the work for you! Remember when I said that customers like social media because it makes it easy to ask questions? Visit any company’s Facebook page and you’ll likely see a variety of comments from social media users, ranging from questions to complaints to everything else a customer or potential customer might want to share online. Instead of writing letters, making phone calls, or even visiting a business in person, people can now visit a company’s social media profile from their computer or phone and leave a comment in just a few seconds. And because they can comment so quickly, customers also expect businesses to respond quickly. It’s important to make sure you are seeing and responding to all comments that people leave on your social media profiles, even the negative ones. Ideally, you’ll want to check for new comments multiple times throughout the day and respond promptly to provide answers, assistance, or a solution for any problems your customers have. Social media provides a direct line to your customers, so take advantage of that by listening to what they have to say! When it comes to negative comments, you should look at them as an opportunity to turn a customer’s experience from bad to good. Apologize for any problems and offer a solution that will help the customer. Even if they’ve had a bad experience, having a good customer service experience over social media can be much more memorable! Also, if anyone posts anything totally inappropriate on your page, you can delete it. But don’t delete any other comments—that’s just a bad look for any business. Once you set up your social profiles, they need to be discoverable from your website and you should be encouraging your customers to follow you. Be sure to let them know that your social media channels are the best place to keep up with the latest news, product updates, and a place to go for sales, promotions, giveaways, and more. A couple of ways to do this are to use the AddThis suite of website tools. I recommend placing the Follow buttons in your website’s footer, so it follows the customer as they navigate throughout the site. Another tactic is to use the AddThis Link Promotion tool, which is great for catching your visitors’ attention. It also allows you to create a call-to-action for a more enticing and interactive experience. A successful social media strategy takes time and research. 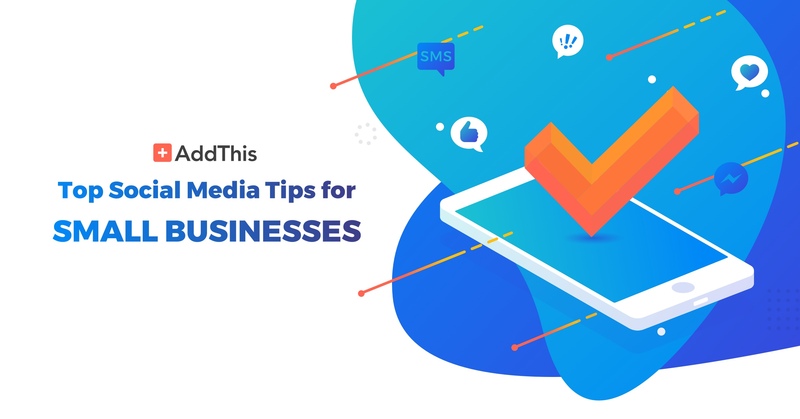 Even with tips and the right tools, it can still be difficult for small business owners to take advantage of all the benefits social media has to offer. That’s why it can be a good idea to ask for help. Professional digital marketers (like the team at Pennington Creative) can help you find your way on social media, creating an online presence that makes a great impression. If you don’t have the time or patience to handle social media marketing on your own, don’t be afraid to ask for help! Jessica DeMilt is a Digital Marketing Manager for Social Media Services. She was born in New York, but has spent most of her life in Tucson. She earned a BA in psychology from the University of Arizona in 2010, but was always interested in creative writing and wanted to explore the world of marketing. This passion brought her to Pennington Creative, where she became a content creation team member in late 2010. Jessica was responsible for creating unique blogs and social media posts for a wide variety of small businesses. In the fall of 2015, Jessica was promoted to editor and became the leader of social media services.